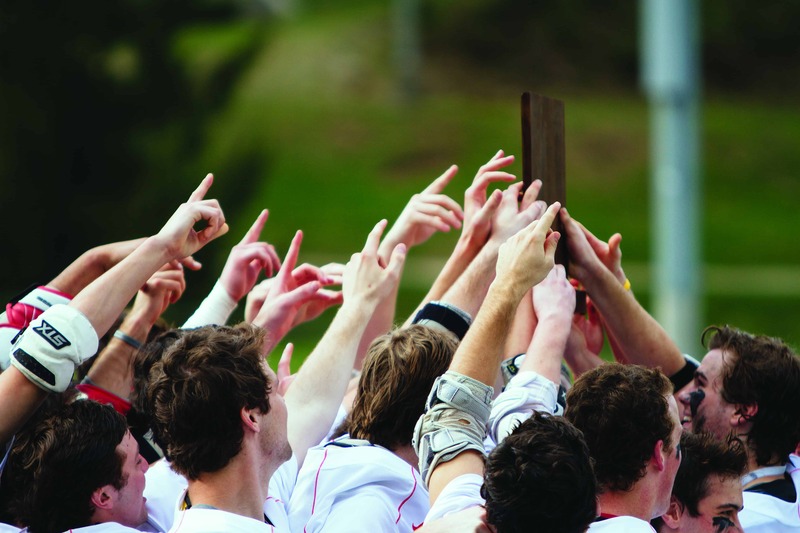 The men’s lacrosse team solidified its place next to the swim team as one of Denison’s banner sports programs. On April 26 the team, ranked fourth in the nation, defeated the Ohio Wesleyan Battling Bishops handily, 14-5, and captured the NCAC title. The Big Red finished the regular season undefeated for the first time in 47 years, with a 15-0 record. The men carried that momentum into the NCAC tournament, defeating Wittenberg 18-3 in the semi-finals, and then subsequently overcoming archrival OWU for the second time this season. The team will advance to the NCAA Division III Tournament for the 21st time in program history. In addition, the victory over OWU set a new school record for victories in a season. Denison started off the game strong, with three goals in the first quarter. In his third career start at goal, Clark Bullington ‘16 prevented the OWU attack from heating up, allowing the Big Red offense to build a substantial lead throughout the game. Bullington posted four critical saves over a four minute span in the middle of the first quarter. After back to back saves from Bullington, Vita scored the first goal of the game. DU extended its lead to 3-0 after additional goals by Vita and Benjie Colberg ‘15. The quarter ended after OWU’s John Umbach netted a goal with just one-tenth of a second left on the clock. Vita matched Umbach’s goal with a third of his own in the second quarter. OWU’s Tommy Minkler responded with a goal but with just under two minutes remaining in the first half, Luke Walsh ‘17 scored the first of his five goals in the game. Walsh has scored 44 goals in his young career, and has shot a 46 percent average. The Big Red led 6-2 at the beginning of the second half, and extended its lead by three points in the first eight minutes of the half. By the end of the third quarter, Denison led by seven points. The Big Red added four more goals in the final quarter for the win. “I think that [the OWU players] were very tired and worn out by the second half, so once we started [picking up] toward the end of the second quarter and toward the beginning of the third quarter we just exploded and just played our game, because we had already asserted ourselves in many different ways,” Walsh said. Blair Farinholt ‘16, Teddy Powell ‘15 and Chapin Speidel ‘14 rounded out the Big Red’s scorers. Head coach Mike Caravana said that the team will spend the next week focusing on making the team more cohesive as a whole. The NCAA Division III Tournament begins on May 7. The site and time are to be determined. The NCAA will announce its brackets for the 2014 tournament on May 4.